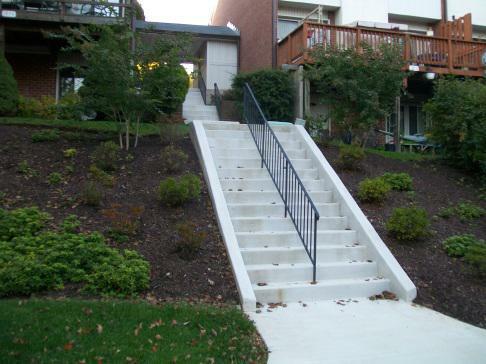 Concrete is a durable material that's excellent for sidewalks, curbs, dumpster pads, and similar structures. In addition to its strength, this material holds up well to the elements. However, when concrete becomes cracked and broken, it not only detracts from the overall look of a property, it can become a safety hazard. 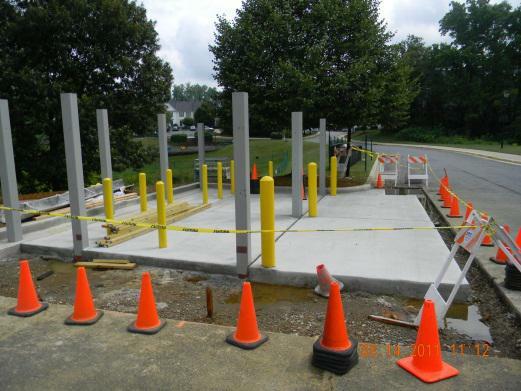 PTG Enterprises are experts with commercial concrete jobs. We work closely with you to ensure the details of the project are fully understood, and that timetables are met. Our crews are extremely familiar with all types of concrete paving, so you know the job will look professional and last for years to come. If you can form it you can build it with concrete. 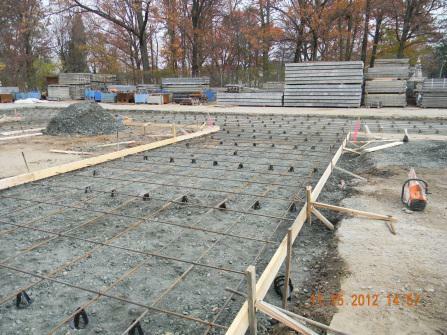 Strong well-constructed footers are the bed rock your structure will stand on for decades to come. Don't leave it to chance. 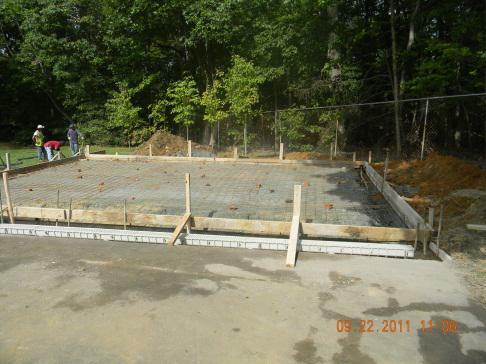 PTG will construct your foundation needs to last a lifetime. Almost all parking lots have a need for curbing of some kind. 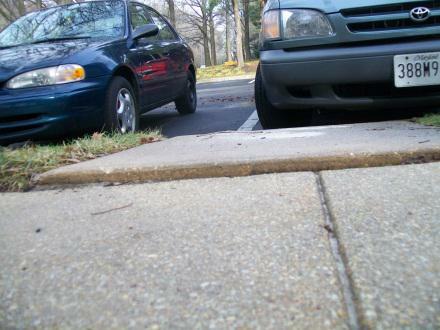 Curbing serves two distinct purposes. First it works as a break point between the end of the parking lot and the start of the sidewalks or green areas. Second, and more importantly, curbing catches storm water into its gutter pans and directs that water to storm drains. 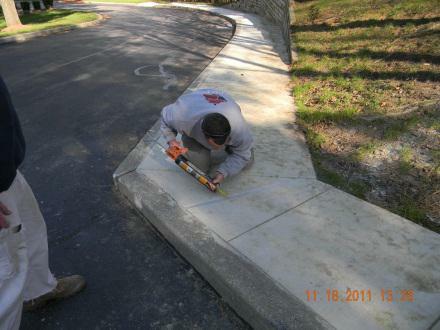 It is important that the initial installation of the curbing be installed at proper grade to ensure a constant falling flow until the water has reached its designated drain. 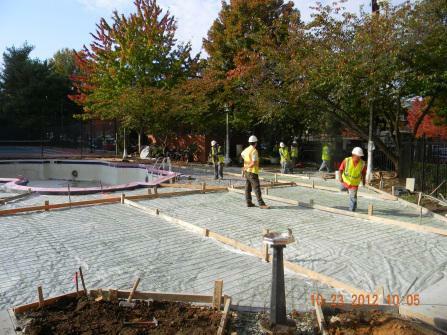 If installed improperly, ponding and water issues will quickly appear where grades are off. At those locations the client could expect standing water. This is why having an experienced contractor is vitally important. 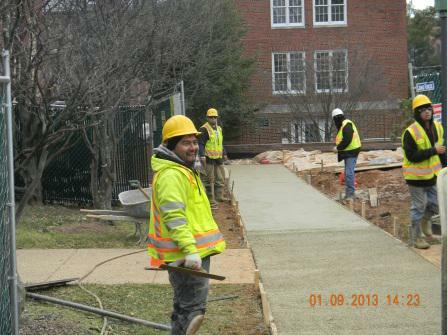 Sidewalks, aprons, dumpster pads, loading docks, floors – we are experts at all of it. 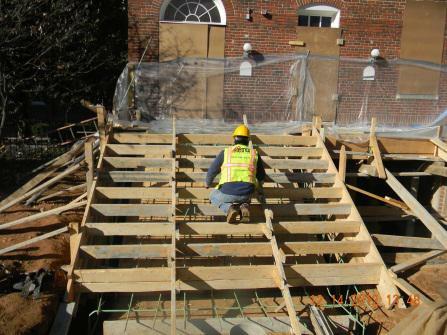 The construction of staircases involves the skill of both a carpenter and concrete experts. If drawings are included, then it is important that they are read and followed properly. If there are no details then it is even more important that the contractor be able to correctly calculate rise and run to allow for proper installation. The Americans with Disabilities Act has very precise requirements to maintain full compliance. 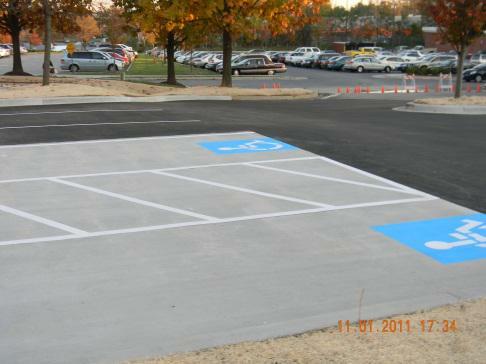 Our crews know the codes and will construct handicap ramps, sidewalks, landings and parking stalls to comply with government regulations. We have constructed many dumpster corrals and can construct per your design or we can work together to design one. The important thing to factor in is the size of the dumpster itself and the clearance you need. Often, steel bollards are installed at the rear of the corral to prevent damage to the rear wall. Another choice that must be made is to determine the side walls. We can construct a block wall with or without brick facing or fencing. 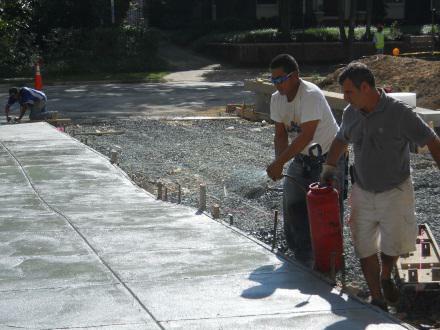 Concrete, like all pavements requires routine maintenance. PTG offers a wide variety of concrete care products and services. 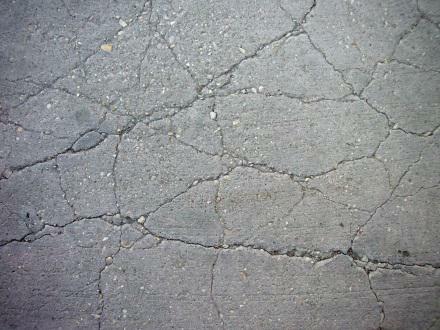 When concrete cracks there are several ways to address the problem. Our knowledgeable estimators will present options to address the symptoms as well as the underlining problems. 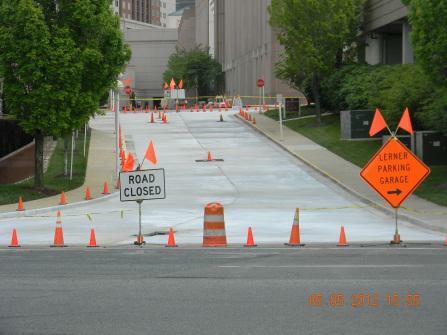 During new construction, expansion joints are installed to allow sifting and movement of the concrete. Over time, the fill materials rots and needs to be caulked. Caulking will prevent water intrusion into and under the concrete saving thousands in future repair costs. as sidewalks settle they sometimes create "trippers". PTG will help you identify these areas and repair them, eliminating any potential liability. Sealers can be very effective in preserving the surface integrity of concrete or can prevent spalling concrete from getting worse. There comes a time when it becomes more cost effective to replace the pavement rather than repair it. PTG will de-construct, remove and replace anything made with concrete. The most common used sizes of re-enforcement bars are shown below. 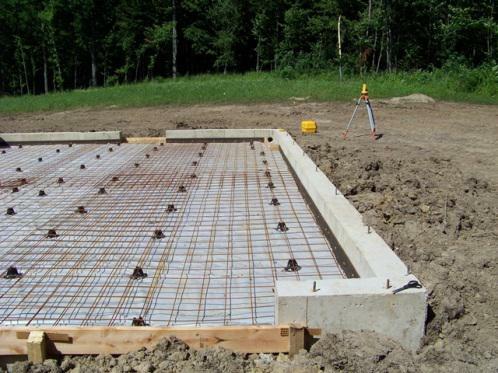 Re-bar is used in structural concrete to give the concrete additional strength. It is laid in a grid pattern on stands within the work zone area. 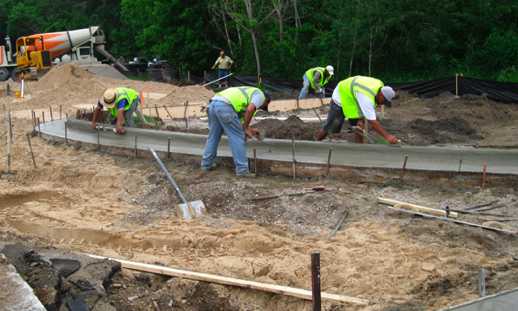 The concrete hardens and cures around the re-bar and will double the strength of the concrete. Reinforcement bars are made of steel and the price of steel has been extremely volatile over the past few years. is typically polypropylene (plastic) fibers introduced into the mix during the batching process. 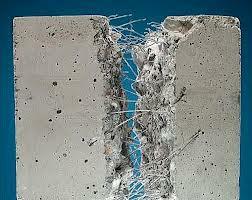 These fibers serve as a secondary reinforcement in the concrete. In most cases, fibers can replace welded wire fabric as a means of secondary reinforcement. If you could look into a cube of Fibermesh concrete, this is what you would see: millions of virgin polypropylene Fibermesh fibers uniformly distributed in all directions throughout the concrete mix. As micro cracks begin to develop due to water loss and shrinkage, the cracks intersect with Fiber mesh fibers which block their growth and provide higher tensile strain capacity at this critical time. So, the cracks won´t develop into macro cracks and problems. This has been proven in test after test in independent laboratories and verified on jobsites throughout the world.